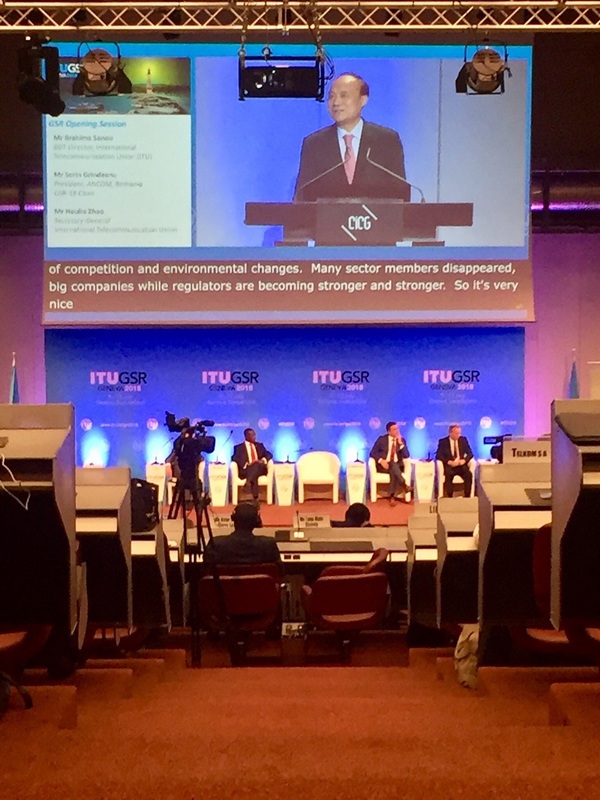 The 18th Global Symposium for Regulators was hosted by the ITU at Geneva from 9-12 July. Speakers at the opening session on 10 July and a panel on the Leadership Debate: Emerging Technologies for Digital Transformation, were positive and encouraging about the opportunities from emerging technologies. But they said, in order to facilitate effective use, appropriate regulations are fundamental. However, given the fast-changing pace of technology, it is difficult to regulate pre-emptively. As panellists pointed out, the internet and artificial intelligence are highly disruptive and are becoming omnipresent, requiring some form of regulation. Anatassia Lauterbach, an international technology strategist advisor and entrepreneur, and author of “The Artificial Intelligence Imperative,” said artificial intelligence is one of the most powerful technologies on the planet. She highlighted how the top brands like Apple, Google, Amazon, Facebook and Microsoft all use data and artificial intelligence to develop new technology. The majority of future start-ups will include combining artificial intelligence with existing industries and services, she observed. Lauterbach said she found it “strange” that corporate executives are sceptical about their ability to understand technology-based businesses. As highly skilled professionals, the basics and application of technology, which do not require knowledge of coding, is what they are required to understand, she opined. However, unlike corporate executives, state regulators are much more confident and enthusiastic about their ability. Sorin Grindeanu, president of ANCOM, Romania’s national regulating authority for communications, mentioned that it is currently working on regulating the 5G spectrum that is expected to be commercially available in a few years. Brahima Sanou, director of the ITU Telecommunication Development Bureau, also commented that regulators are ready to work with emerging technology and said his concern is more about consumers being able to catch up. Ajit Pai, chairman of the United States Federal Communications Commission, in his speech stressed ‘regulatory humility’ as one of the guiding principles for governments who should promote a competitive marketplace and let market forces work. The second principle he outlined was that the government should facilitate, not frustrate, innovation and investment. Regulations cannot be one-size-fits-all, he said, adding that, for instance, small cells should have less regulatory hurdles and shorter approval processes than for, say, a tower. Focusing on the importance of investment in the ICT sector, Pai remarked that “dumb pipes would not deliver smart cities.” When it comes to facilitating growth, he cited an example of the administration’s faith in the industry to develop technology and standards for the 5G spectrum instead of waiting for regulation to be in place before opening up the spectrum. Lastly, he emphasised that universal access is another guiding principle. The ideal regulatory approach for the internet, according to Pai, is market-based, flexible and light-touch network enabling it to remain free and open. Emphasising that connectivity is at the core of ITU’s mission, Pai concluded with the hope that connectivity would facilitate more innovation and greater international unity. This was echoed in the statement made by ITU Director General Houlin Zhao in his speech that investment in ICT was crucial and the digital divide ought to be bridged. He also highlighted that ICTs can facilitate the implementation of all 17 of the UN Sustainable Development Goals (SDGs) harnessing ICTs for the greater good and for everyone. "Regulating The Internet And Emerging Technology: The Path Ahead" by Intellectual Property Watch is licensed under a Creative Commons Attribution-NonCommercial-ShareAlike 4.0 International License.